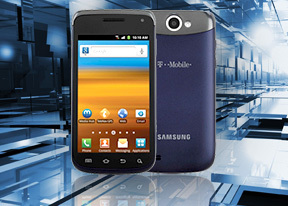 The Samsung Exhibit II for T-Mobile starts off with the basics – quad-band GSM/GPRS/EDGE and quad-band 3G. There’s HSPA+ with 14.4 Mbps downlink and 5.76Mbps uplink too, which T-Mobile brands as “4G” even though it’s technically not. Moving on, there’s Bluetooth 3.0 and Wi-Fi support, which includes a/b/g/n protocols. The AllShare app allows you to stream content to and from different kind of devices (TV or computer). We didn’t give it a proper run for its money, but we guess it works over DLNA. The browser supports both double tap and pinch zooming along with the new two-finger tilt zoom. There are niceties such as multiple tabs, text reflow, and find on page and so on. A neat trick is to pinch zoom out beyond the minimum – that opens up the tabs view. The Social hub we’ve seen before – it combines you email accounts with social networking (Facebook, Twitter, MySpace, LinkedIn) and IM accounts (Gtalk, MSN and Yahoo! Messenger) and shows all incoming messages as one list with handy shortcuts to reply, mark as favorite and so on. There’s filtering by message source too, to help manage the inflow of incoming updates. The Media Hub lets you buy or rent movies or TV shows. Its interface is neat and intuitive, while its setup will take you no time. The Samsung Exhibit II for T-Mobile comes with the Polaris Office preinstalled, which seems to be getting rather popular with hardware manufacturers lately. And for good reason, we guess – it’s one of the most feature rich mobile editors we’ve seen. You can view and edit Word, Excel and PowerPoint documents and there’s a PDF viewer as well. The app allows you to search for your office files just like with a file explorer. The list view shows a list of all the calendar entries from the recent past to the near future. It’s a very handy tool when you need to check your appointments for the next few days. The Samsung Exhibit II features a decent alarm clock application which allows a huge number of alarms to be set, each with its own start time and repeat pattern.